On 2010, Oct 28.47, we were able to secure some additional follow-up about the faint returning comet 164P/Cristensen. The images were obtained through the Faulkes Telescope South (Siding Spring, Australia), a 2.0-m f/10.0 Ritchey-Chretien + CCD. At the time of our observation the comet was about 70 deg above the horizon, in a moonless sky. Under good seeing conditions (FWHM of nearby field stars about 1 arcsec) we stacked several R filtered exposures, 60-sec each, and found the comet moving at the expected postion: 164P/Christensen was a starlike object, at about magnitude R~ 20. Its measured astrometry was in good agreement with our previous recovery data batch of 2010, Oct 7 and 11 (see our previous post here). We kindly acknowledge the Faulkes Telescope Project for the telescope time we used. The asteroid designated 2003 UV11 was discovered on October 21, 2003 by B. Skiff during the LONEOS survey with a 0.59-m Schmidt. According to its absolute magnitude (H=19.3) this object has an estimated diameter of roughly 400-500 meters, so it is a relatively large near-Earth asteroid. 2003 UV11 will have a close approach with Earth on 2010 October 30 when it will be within 0.013 AU (~5 lunar distances). The asteroid will reach a magnitude around 12 over the next few days (28/30 October 2010), becoming an easy target for small-medium sized telescopes + ccd. When we shoot our image this rock was at 0.030 AU from Earth and speeding at about 30"/min, shining at about magnitude 12.3. At the moment of its close approach on October 30, this object will be moving roughly at 160"/min. 2003 UV11 will be observed with the Arecibo and Goldstone radars on Oct. 30, 2010, when it will be a very strong radar target. 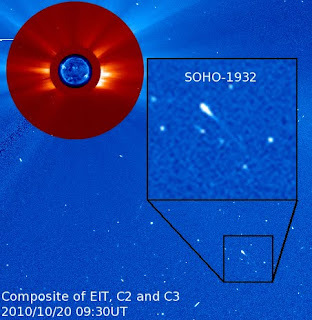 A new bright comet (designated SOHO-1932) diving into the Sun has been discovered on Oct. 19th by Bo Zhou using the images taken by SOHO spacecraft. This object belong to the famous Kreutz-group comet, a family of sungrazing comets that are named after German astronomer Heinrich Kreutz who first studied them in the details. These comet fragments passes extremely close to the Sun at perihelion and usually they completely evaporated during such a close approach. Several sungrazing comets are discovered each year in SOHO images, many of them are very small and faint while sometimes some bigger and bright fragments arrive in the proximity of the Sun. 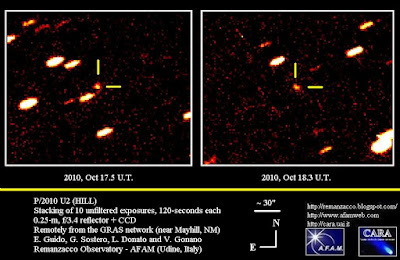 IAUC nr.9174, issued on 2010, Oct. 18, announced the discovery of a new periodic comet by R. E. Hill through the Catalina 0.68-m Schmidt telescope, on images obtained on 2010, Oct. 17.3. 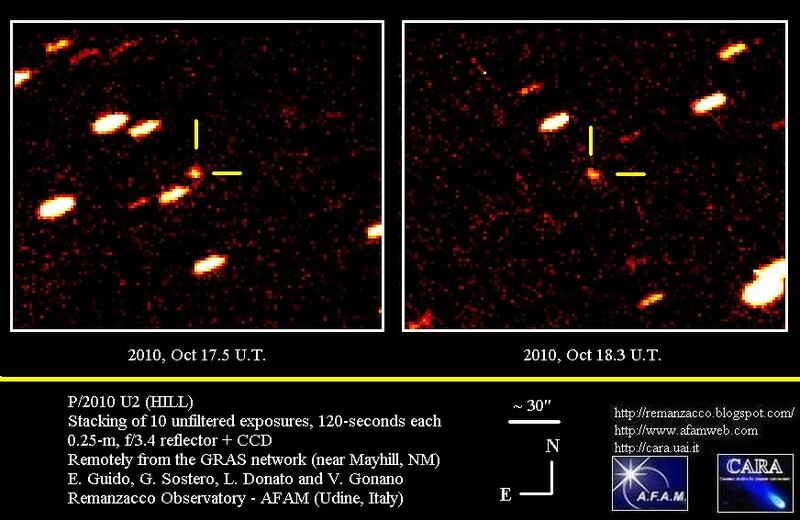 The new comet has been designated P/2010 U2 (HILL). 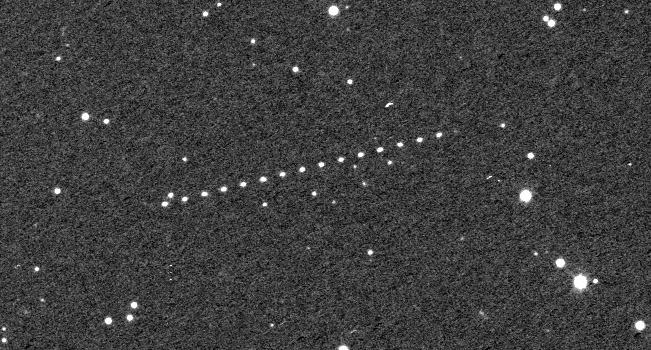 We performed some follow-up measurements of this object while it was still listed in the NEO-CP, on 2010 Oct. 17.5 and 18.3, remotely from the GRAS Observatory (near Mayhill, NM) through a 0.25-m, f/3.4 reflector + CCD. Analysis of two different series of 10 unfiltered stacked images, 120-seconds each, showed that this object appeared non-stellar. Through our images, we were unable to discriminate a definitive coma, however we measured on both nights its FWHM nearly 40% wider compared to that of nearby field stars of similar brightness, indicating a slightly diffuse nature at the threshold limit of our instrumental set-up and seeing conditions. In our stackings of both nights, there was also a hint of elongation in a south-west to north-east direction (or the other way around, not easy to tell), while the field stars had an ordinary symmetrical profile. This might indicate the presence of a little tail or elongated coma, below our resolving power for that night (and, indeed, the discoverer reported a thin tail about 15"-20" long in p.a. 240 deg). 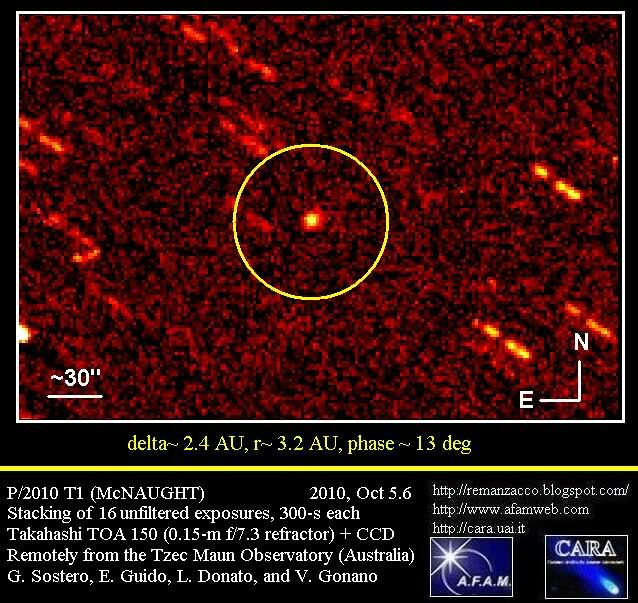 MPEC 2010-T98, issued 2010 October 13, reports our recovery of comet 164P/Christensen. 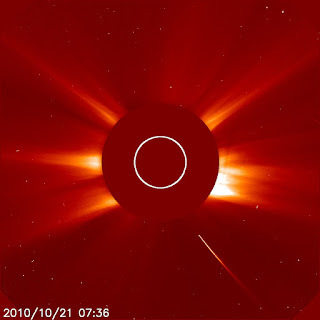 We found the comet on October 07 and October 11, 2010 at about magnitude 20.4. We imaged it remotely from D96 code (Moorook) using a 0.15-m f/7.3 refractor + CCD. 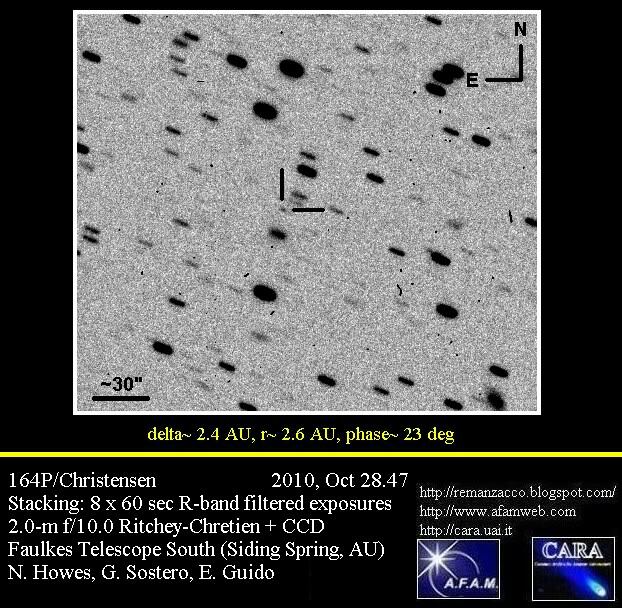 On 2010, Oct.11 the seeing conditions at Moorook (Australia) were exceptional, so we had the chance to identify the comet at the very limit of our capabilities, as a faint dot of light (magnitude about 20.4). 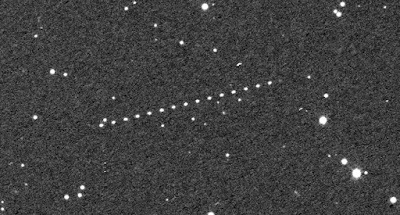 Then, knowing where to look for, we searched in our archive images, and found it again in our stackings of 2010, Oct. 7; then we had the astrometry over two nights, that was fitting pretty well the expected orbit of 164P. However comet 164P/Christensen is much fainter (more than 3 magnitudes) compared to the predictions. 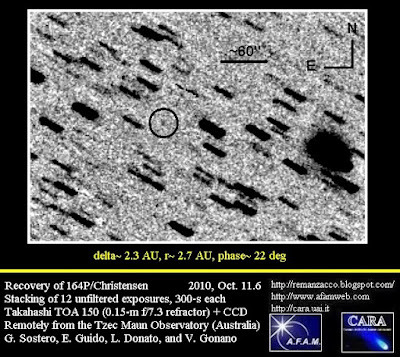 Comet 164P/Christensen was last observed (before our recovery) on June 18, 2005 by G96 (Mt. Lemmon Survey). The small asteroid 2010 TD54 passed at about 45,500 kilometers above the Earth on October 12, 2010. 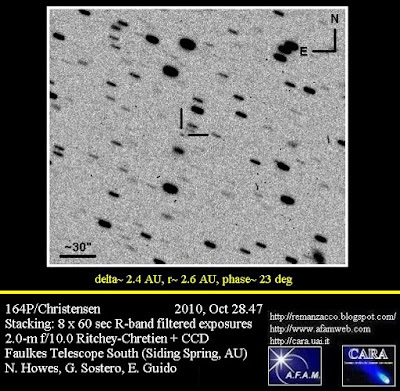 The asteroid was discovered on October 09, 2010 by one of the telescope of the Catalina Sky Survey. According to NASA JPL website, this small object is estimated to be about 5 to 10 meters wide. 2010 TD54 has zero probability of impacting Earth. Anyway objects of these size are expected to burn up high in the atmosphere and cause no damage to Earth's surface. IAU circular No. 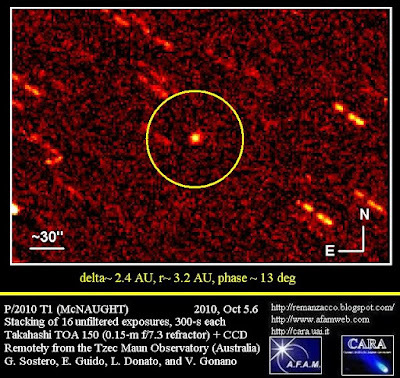 9172, issued on October 05, 2010, announces the discovery by R. H. McNaught of a diffuse comet on CCD images obtained with the 0.5-m Uppsala Schmidt telescope. 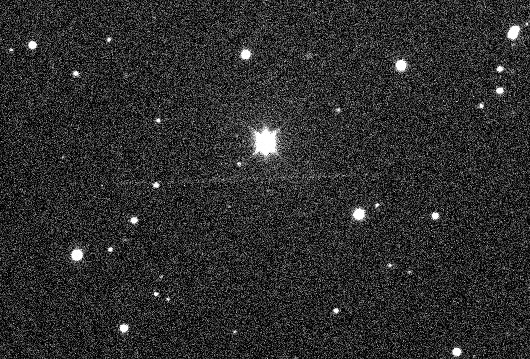 After posting on the Minor Planet Center's NEOCP webpage, some observers have commented on the cometary appearance of this 18.5 magnitude object, designated P/2010 T1 (McNAUGHT). We have been able to confirm this object remotely, using a 0.15-m f/7.3 refractor at the Tzec Maun Observatory (near Moorook, Australia): on October 5.6, co-adding of 16 unfiltered exposures, 300-seconds each, shows a coma nearly 7-arcsec in diameter with a central condensation, and a broad fan-shaped tail about 12-arcsec long toward PA 310. The preliminary orbit for comet P/2010 T1 (McNAUGHT) shows perihelion on November 24, 2010, at about 3.2 AU. The period is about 10.2 years. This is the 57th comet discovered by McNaught.